Truth: since New Year’s Eve, I have been a little under the weather. .. almost the whole family was afflicted with this evil congestion-body aching illness! Came back to work Monday at maybe 40% my usual self (minus a voice), and today, I think I’m down to 30%… but, I’ve stuff to do so I must persevere!! 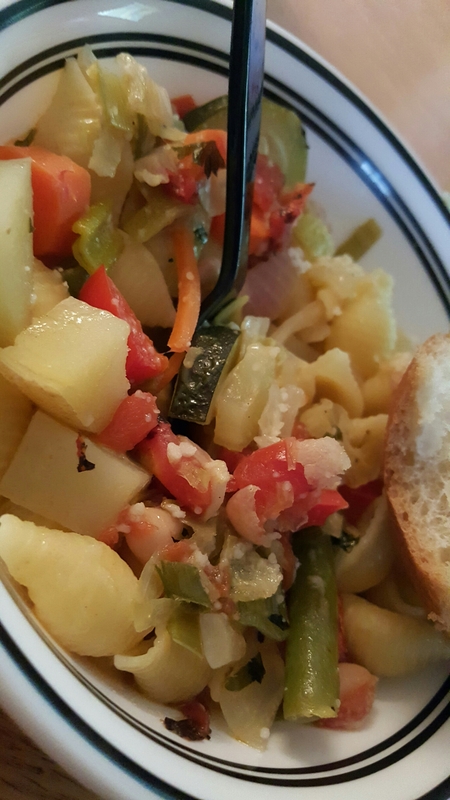 To help my co-workers from contracting this hideous illness (and after a very thorough hand washing), I made a vegetable-packed minestrone with pasta and italian chicken sausage on the side (thanks for sharing the Italian sausage Mike Jewell! ) (for the more sensitive bellies among us). If you’ve got the funk in your house, or you’re just looking for a good, healthy soup, give this a shot. Heat 2 T olive oil in a large stock pot. Add minced garlic, ginger, onion, carrots, celery, potatoes, green beans and leeks. Stir over medium heat for 5-8 minutes or until vegetables soften. Add vegetable stock and cabbage, peppers, squash and zucchini and parmigiano and both cans of beans and tomatoes. Test the seasonings. Add Bay leaf, if desired. Add crushed red pepper flake. Bring to a low boil, reduce heat and simmer for 25 minutes. To serve: tear baby spinach leaves, place in soup bowl, spoon a little pasta over the spinach, then ladle soup over top. I find this just wilts the spinach, allowing a little texture to remain. Like all the wonderful italian soups, finish the top with a drizzle of olive oil and of course, top it with more parmigiano! Feel free to add or subtract veggies to accommodate for your order your family’s tastes. Next Post Kudos to Cooking Light!